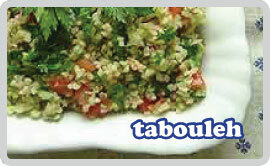 I do love a bit of tabouleh. No middle eastern meal is complete without some of this intensely fresh tasting dish alongside. It works perfectly with some grilled lamb or kebabs. Try one of my marinades for the lamb. Place the bulgur in cold water by about 5 cm. Leave for 30 minutes or so, then drain and squeeze out as much excess water as possible. Add to a large bowl, then add all the other ingredients and combine well. In a bowl, with some grilled lamb or fish.